A blog filled with healthier versions of delicious recipes from around the world - keeping the calories low and the taste fabulous! 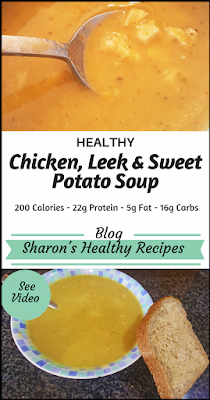 I love the classic version of leek and potato soup but wanted to add some protein and swap the white potatoes for sweet potatoes to raise the nutritional value and make this a healthy soup recipe. 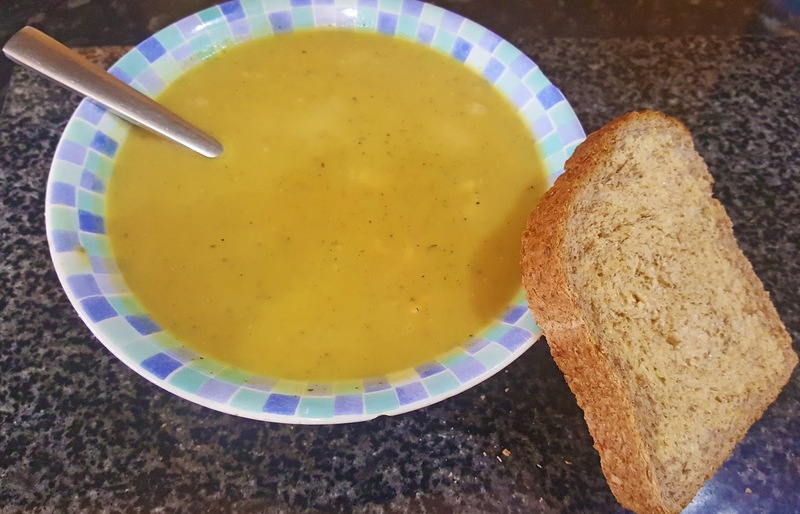 It has taken a while but I have finally got this healthy chicken, leek and sweet potato soup recipe just right and I can share it with all of you! You will need a hand blender (link below) or food processor for this recipe so that you can create a smooth and creamy soup consistency. 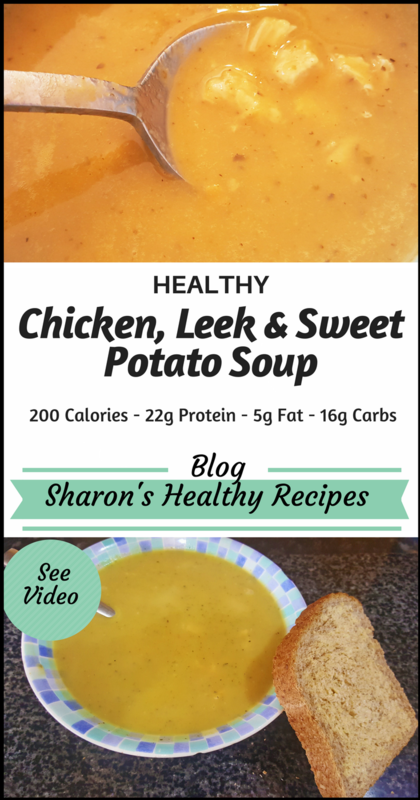 The amount of chicken in this healthy chicken, leek and potato soup recipe means it is a high protein meal with 22g protein per portion. Not only is it high in protein but it is low fat and only 200 calories! This soup is easily kept in the fridge or frozen and so is a good option for meal prepping. In a large pan or stock pot, melt the coconut oil and add in the onions. Fry until browned, then add in the leeks and cook until softened. Add in the garlic (chopped), salt and pepper. Add in 500ml boiling water followed by the stock cubes and mix to dissolve. Add another 500ml boiling water, then the celery, carrots and sweet potato. Add a final 500ml boiling water and bring to a simmer. Add in the chicken fillets (whole). If you are using frozen chicken, ensure it is raw so that you are able to freeze some of the soup later. Simmer for 20 minutes and then remove the chicken. Shred or chop the chicken into small pieces and set aside. Blend the soup with the hand blender (if using a food processor you will need to let the soup cool before blending). Add in the double cream and then check the seasoning. Return the chicken to the pan and mix before serving. I hope you enjoyed this healthy chicken, leek and sweet potato soup recipe, it will keep in the fridge for a couple of days and also freezes well. It goes well with a thick slice of wholemeal bread (not included in the macros). Let me know if you tried it and what you thought! Check back for upcoming recipes and meal prepping ideas! 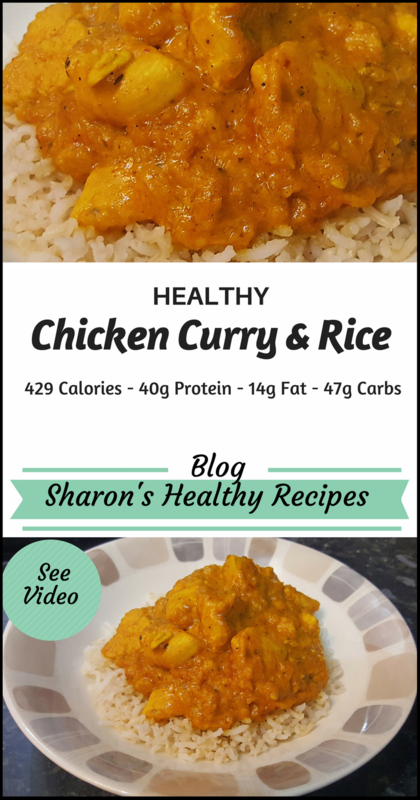 This version of chicken curry is my favourite, I love the taste and the fact that it is less than 450 calories – including the rice! Read on for the full recipe breakdown. You will need a food processor or hand blender to make the curry paste (link to the one I use below). 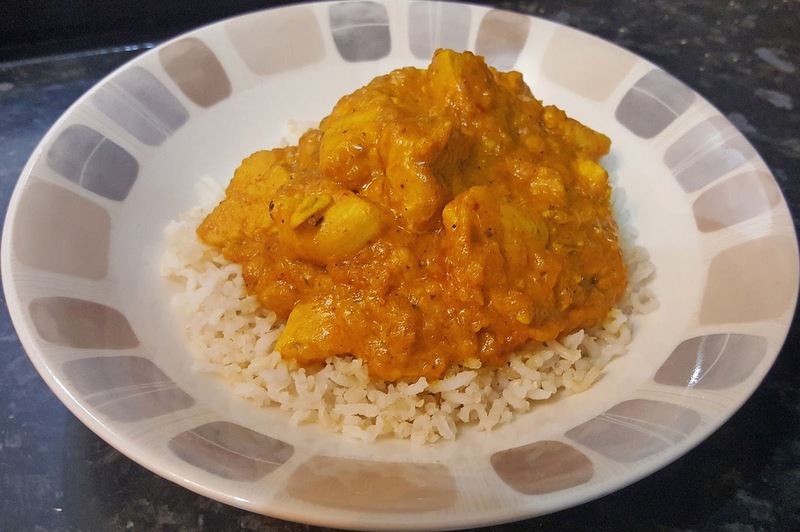 I hope that you like this healthy chicken curry and rice recipe as much as I do, after all it is a win win - kinder on your waistline and your pocket, those takeaways are expensive! Good News! this recipe is a high protein meal, there are 40g in just one portion and if you don’t want all the carbs in the rice you can always use cauliflower rice instead. If you are a watcher rather than a reader, you will be pleased to note that there is a video for this recipe on my Youtube Channel, just click the link below to see it. Chop the peppers, onion, garlic and ginger and place them into a food processor with the standard cutting blade fitted. Add in the stock cubes, turmeric, curry powder, herbs and tomato puree and blend for a minute or so before adding in the apple cider vinegar and continuing to blend until your paste is as smooth or chunky as you like. Using a roasting tray or oven proof pan on a medium heat, melt 1 heaped teaspoon coconut oil and fry the chicken until lightly browned. Add your paste and stir everything together, bringing the mixture to a simmer before adding in 500ml boiling water gradually. Transfer the tray to the oven heated to 200c / 400f or gas mark 6 and cook for 20 minutes, stirring halfway through ensuring nothing is sticking to the sides or bottom of the tray. After 20 minutes, remove the tray and stir in 150ml crème fraiche then return to the oven for a further 10 minutes or until the sauce has thickened. Leave it in longer if it is too thin or add more water if it is too thick. Serve one portion over ½ cup cooked brown basmati rice. 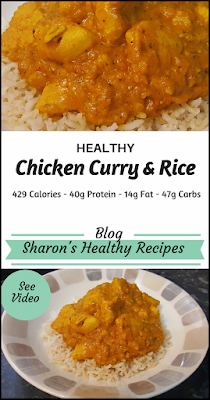 I hope you enjoyed this healthy chicken curry and rice recipe, it will keep in the fridge for a couple of days and also freezes well so can be used as a meal prepping recipe. Let me know if you tried it and what you thought! Check back for upcoming healthy recipes and meal prepping ideas or visit my YouTube Channel for more videos. I love the slow cooker, (link below if you don’t have one) it is so easy to use and you can put everything in and leave it for the day and then when you come home you have a finished meal that you can just dish up. 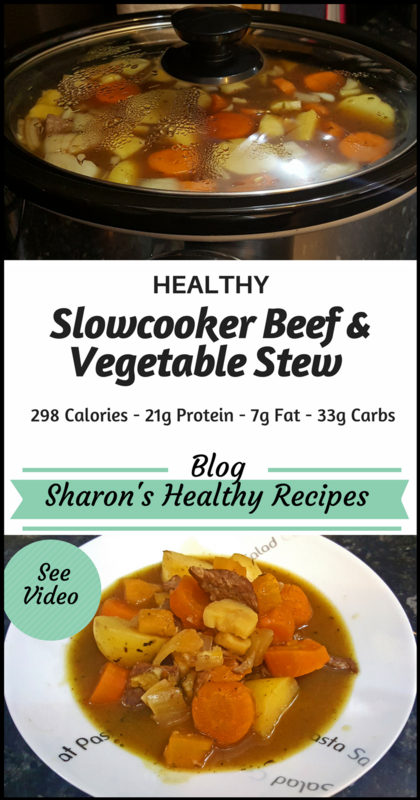 This healthy slow cooker beef and vegetable stew recipe is low fat and is a staple for my family. We eat it at least once a fortnight, especially in the colder months, which is most months in the UK! Turn your slow cooker on high, add 500ml boiling water and add in your stock pots or cubes. Stir to dissolve and then add salt, pepper, 2 tbsp mixed herbs and 1tsp garlic puree. Stir again and replace lid. Melt 1 heaped tsp coconut oil in a pan on a medium heat, then add in your diced beef. Fry until lightly browned and then add 2 tbsp plain flour. Keep stirring so it doesn’t stick to the pan and after a couple of minutes, add the red wine, stirring to deglaze the pan. Remove the lid from the slow cooker and add in your beef. Add 200ml boiling water to the pan and then add this to the slow cooker to make sure you get all the meat juices in the stew. Replace the lid and turn down to low. Add in your vegetables, stir and then replace the lid and leave for 8 hours for the best results. 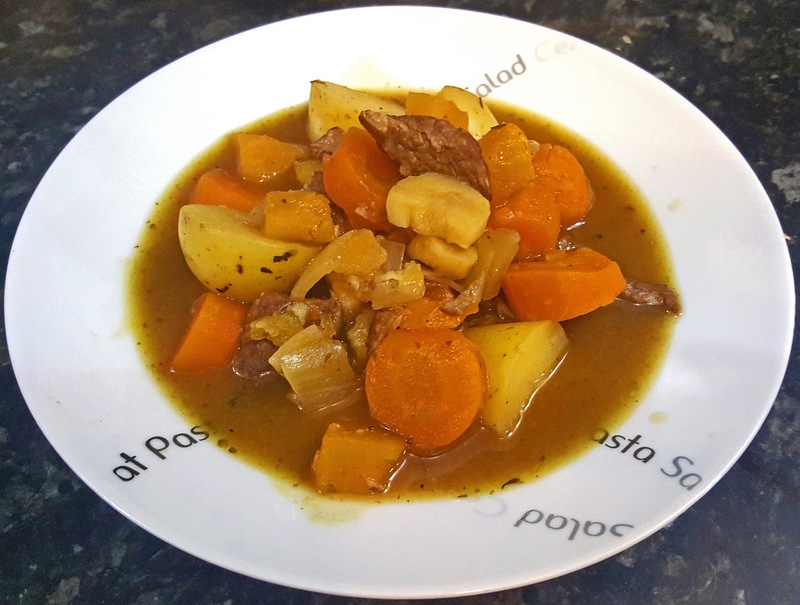 I hope you enjoyed this healthy slow cooker beef and vegetable stew recipe, it will keep in the fridge for a couple of days. You can freeze it although the potatoes will be at their best in smaller pieces if you want to do this and then you can use it as a meal prepping recipe. Let me know if you tried this healthy recipe and what you thought! Don’t forget to like and subscribe, and check back for upcoming healthy recipes and meal prepping ideas!